What’s New in LASS 2.5? We are very excited to announce the LASS Full 2.5 update. Watch our “what’s new in LASS 2.5” video. LA Scoring Strings 2.5 (LASS) brings you a whole new set of tools and revised sonic profiles providing a new level of expressiveness, realism, real-time playability and program-ability to sampled strings. We updated and improved all our Sonic Profile Colors to yield a higher fidelity than before. Every preset was recreated from scratch using our most advanced technology. We also created 25 new Marcato patches and created the “Sordino-izer” that gives any articulation that LASS Sordino sound. Aside from our 2.5 update, the Stage & Color feature (providing an easy way for you to have LASS sound like famous orchestral recordings and film scores), LASS 2.5 has over 85 new patches (compared to LASS 1) ranging from Aleatoric (string effects) to NV-Vib (non vibrato to vibrato) to Real Legato Tremolo and Trill patches. Sordino-izer (new to LASS Full 2.5) – We are excited to announce that you can now have our sought-after Sordino sound on all articulations of LASS Full 2.5. Previously, you were only able to have our Sordino sound on our Sustain and Legato Sordino patches. Now, with the use of our Color and Sonic Profile technology, you have that LASS Sordino Color on patches like: Tremolos, Trills, Staccatos, Spiccatos, Pizzicatos, First Chairs etc. Each patch was individually tailored to achieve the LASS Sordino sound. New to LASS Full 2.5, all Colors that were previously only able to be loaded via the Audiobro Remote Control (ARC) can now be loaded from the patch itself. Much in the same way as described on the previous Sordino Color page. Marcato Patches New to LASS Full 2.5 We are happy to announce a new class of patches for LASS 2.5. A number of users have requested Marcato patches as well as velocity-based dynamic patches as opposed to CC1/Mod-Wheel based patches. So we created velocity based Marcato patches with an “Attack Control” that the user can use to adjust the amount of attack to taste. In case your wondering, “aleatoric strings” is a term often used in film-scoring to describe string sounds that have randomness and dissonance that can heighten the tension and drama in a sc ene. LASS’s Aleatoric patches allow users to perform (in real-time) these types of dissonant string effects that are so sought after in film scores. By assigning the different divisis to a patch and allowing for individual control of tuning and modulation, you are able to create many varieties of dissonant strings while maintaining control of how it reacts over time. These patches are included for all sections (violins, violas, cellos and basses) in a variety of articulations: Sustains, Tremolos, Trills. LASS’s new Legato patches are much more powerful than before. Not only do these patches play non-vibrato and vibrato legato, portamento and glissando articulations, but they also allow you to vary the amount of vibrato in real-time… completely transparently via CC2. Furthermore, when you no longer need the NV-Vib functionality, you can simply “turn off” the NV-Vib mode without purging your samples… thereby saving you polyphony. We are happy to announce a new class of patches for LASS 2.5. 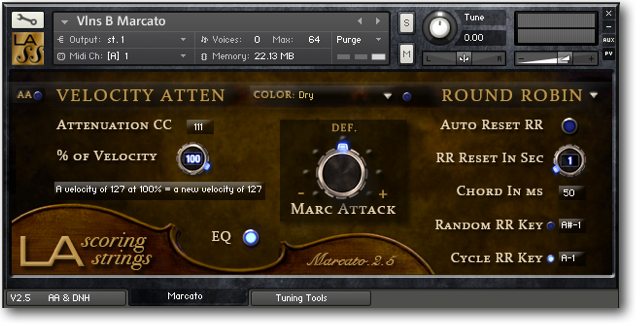 A number of users have requested Marcato patches as well as velocity-based dynamic patches as opposed to CC1/Mod-Wheel based patches. So we created velocity based Marcato patches with an “Attack Control” that the user can use to adjust the amount of attack to taste. Before LASS 2, if you wanted to change the non-performance settings on multiple patches, you would have to make those changes on a per-patch basis. 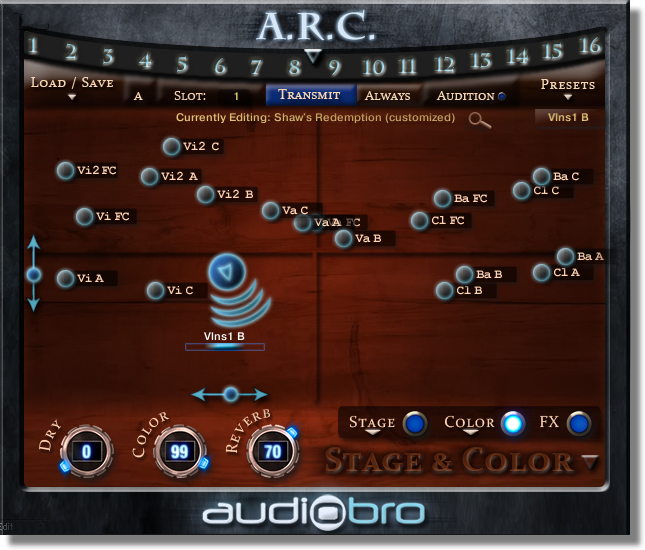 Now with LASS 2 and the ARC, the newly revised scripts “listen” to the ARC and update the settings on as many patches as you choose from within the ARC. Deep integration with the ARC so now you can apply changes to batches of instruments in 1 place. Up to 13 part voice tracking! A new AA On/Off button is now on the main performance view of all patches. New Pedal behavior modes have been added. The Tuning Tool script is now has a Range Tuning and Micro Tuning mode. A new Tuning Amt knob allows you to assign a CC to change the tuning amount in real-time. This allow for dissonant string effects on every patch. Micro Tuning is lets you chose different tuning for each note in an octave and then assigned those tunings across the entire range of the instrument. 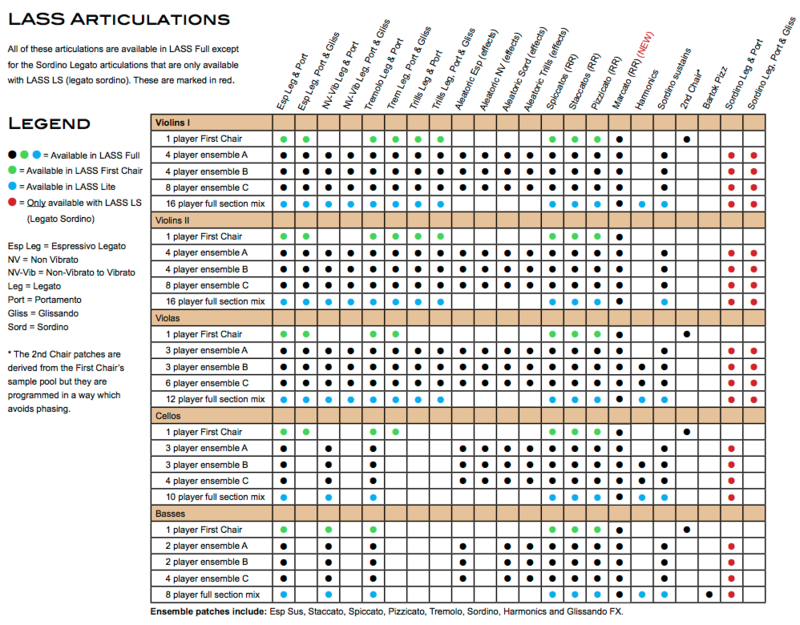 The CC Table script is now accessible from the front panel of the patch. There is a smoothing knob that will even out any jagged table artifacts if you draw them in that way by accident. Requires Kontakt Player 5.2 or later. Click here to download the latest version of Kontatk Player. Note: Mac 10.6.8 users are telling us Kontakt 5.2 (and therefore LASS 2.5) works on their system although it is no longer officially supported by Native Instruments.